It is not just social justice and claims of championing the cause of the dispossessed that are fake in the Islamic Republic. 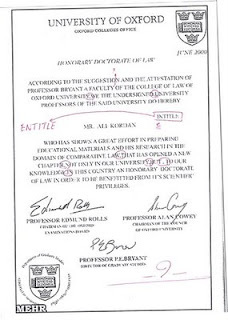 On the left is the fake PHD certificate of the Islamic Republic's minister of interior, Ali Kordan, from Oxford University, which is like everything else in the government of the clerics, also a fake. 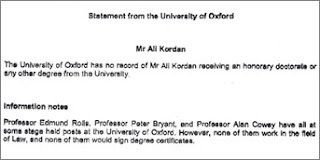 Oxford University has also issued a denial that anyone by the name of Ali Kordan has ever received an honorary doctorate from the university. Think about how many officials, bureacrats, and academics in the IRI have phony degrees like this one.